I hope Josh had fun today. It was a very small party. A lot of his friends were out of town. 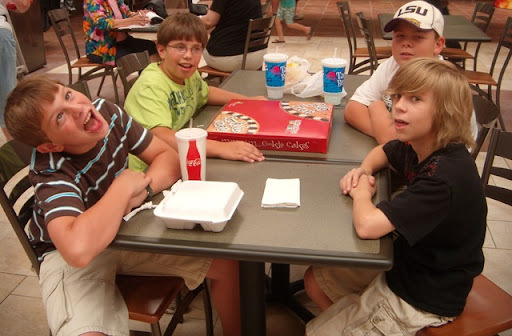 We all met at the food court in the mall. Everybody got to pick what they wanted to eat for lunch. Then we had cookie cake. Yummy!! After that, it was time for the movie, Kung Fu Panda. It was very cute! I know I'm going to hear lines from it for awhile!! After we got home from the party, Brad and I decided to go see his grandfather in the hospital. He was very very sick the first part of the week, but seemed to be much better today. He knew Brad and I by name. They hope to move him to the rehab part of the hospital Monday and then hopefully back to the nursing home. Brad's mom left today to go get our niece who lives in Texas. This is Brad's sister's daughter. Brad's sister and husband are leaving Thursday for Italy for ten days! I would love to sneak in their suitcase!! Jonah is very excited about A coming to stay for a couple of weeks. She is a sweet little girl!! I tried something new when I did this post. I used Windows Live Writer. It seems to be more user friendly than blogger when drafting a post. But since this is my first post, I reserve the right to change my mind!! It is a woman's prerogative!! Jennifer sent me these purple goodies for our color exchange. I just had to show her how the pillow looked on our bed! What a great job you did matching! Did you peek in our room??!! Thanks again! I love everything!! 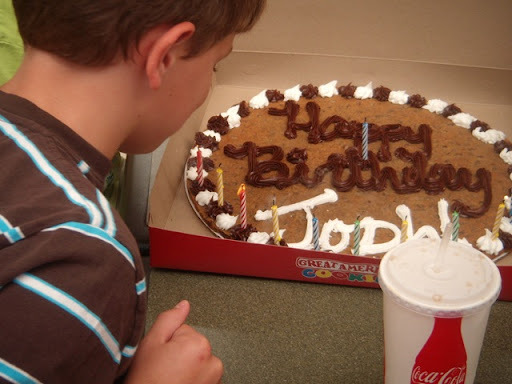 Today we are doing Josh's birthday party. We decided to do something small since most of his friends are out of town. 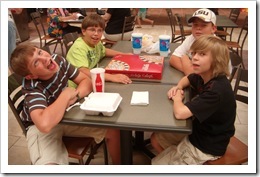 The mall for lunch, a birthday cookie and a movie! Sounds nice and easy and most of all COOL!! The movie he picked out is Kung Fu Panda. One more picture! I made these key chains for a friend at work. Isn't W precious?? I'll have to make her a new one in August because there will be a sweet baby girl joining their family then! In one of my yahoo groups, we did a color exchange. Here's some pictures of what I made Cheryl. She picked the color teal. I never thought about all the shades of teal! I ended up making most of her goodies. I'm not a good shopper. The strawberry chart and instructions came from Anita's Little Stitches. ( http://www.anitas-stitching-addiction.blogspot.com/ I tried to link to it but it didn't work! sorry!) It was supposed to be done in pastels, but I did it in teal for Cheryl. I think it turned out pretty! And the bookmark was my favorite! That's the prettiest one I've done. My BFF Laura has been bragging on me and my cooking. Wait til she finds out what I cooked tonight!! This has got to be the EASIEST chicken ever and it's the BEST. All I did was put 4 chicken breast (frozen) in the bottom of my 21 y/o crock pot (it was a wedding present!!) and poured Pace Picante sauce over it. I cooked it on high for 3-4 hours, or you could do it on low all day. Then I took the chicken and shredded it and made quesadillas. Last time I made this I did about 8 breast and froze half of it. Makes for an easy supper when you're tired and don't feel like cooking. I haven't talked to Jake all week until today. I'm missing him!! His cousin called me today and made him talk to me. Poor Jake. He wasn't feeling very good. Said his lunch wasn't agreeing with him. Hope he feels better soon. He'll be home Friday evening. I can't wait to hear all about his week. 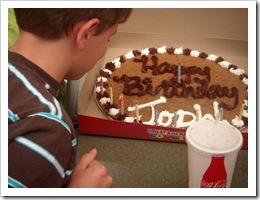 Today is our middle son Josh's birthday. Twelve years ago he was born, on Father's Day! Josh always says he was the best Father's Day present ever. The joke was Brad didn't get me anything for Mother's Day that year and I wasn't going to get him anything either. Instead I gave him the best present ever!! Where did the time go? Seems like just yesterday he was a sweet little blond headed boy that said he first sentence at 10 months! I think that boy came here talking!!! He is my funny child. Always laughing or making you laugh. Now he is growing up. Going into 7th grade, working out getting ready to play football. He has the biggest heart of anybody I know. We always let the boys pick where they would like to eat their birthday dinner. A favorite place they always pick is the Japanese steak house. He wanted to go there tonight but wouldn't go because his big brother is away at youth camp. He knew Jake would be disappointed if we went without him. What a guy!! I was proud of him. Here's my favorite picture of him. I know I've shown it before, but I love it!! He's my angel!! We had a wonderful Father's Day yesterday. My dad and his family, my brother and his family, my aunt and mother-in-law were here. We had a house full!! Brad did an awesome job of cooking again!! There was nothing but a few french fries left. Yummy!! We got dad an iPod shuffle. Brad put some music from the 60's on it and he was in heaven!! I hope he had a wonderful day. He deserves it. He's a wonderful father. I know the day was hard on Brad. He misses his dad so much. It's hard to believe he's been gone for 2 years. It has been a LONG day today. We got up at 4 this morning to have Jake at the church at 5 to leave for camp. UGH!! I'm ready for bed!! Vacation Bible School was this week at our church. I know Josh and Jonah had a great time! Jake helped with the 4th graders and was totally exhausted every day when he got home!! He told me he was NEVER having kids! lol I didn't help this year because of my work schedule. It was very strange not to be a part of it. Next year, I may schedule off that week!! My brother called the other night to try to figure out how we wanted to celebrate Father's Day. We ended up volunteering Brad to fry fish and shrimp!! Poor Brad!! Jake leaves for youth camp early early Monday morning, so I'm sure I'll be washing and packing today. He is so excited about going. I'm kinda sad because I'll miss him. Wonder if I should save the yard mowing for him when he gets home......I've turned him loose this summer with the yard. I hate yard work and gladly gave him the job!! Yesterday he said he mowed and weedeated for 2 hours. I was very impressed! Stitching wise, I have pictures to show you soon of what I've been doing. It was a color exchange. My partner picked teal. I had a lot of fun with this! You know what color I picked..lol I got my package Thursday!! Jen was my partner and she has pictures on her blog!! I just love all my goodies. I've promised her a picture of the pillow on my quilt. It matches perfectly!! We couldn't decide where to go for our anniversary. Thought about New Orleans, our favorite place to go because of the food! !, thought about Hot Springs, thought about Jackson and a few other places. We just couldn't decide what to do. How sad is that?? Had a babysitter for the weekend and everything. Guess I was being to practical with gas as expensive as it is. And everywhere we wanted to go, we kept thinking that it would be more fun with the boys!! Pitiful, I know!! So here is what we decided to do: a progressive dinner!! We have several favorite restaurants here that we like different things. Our first choice was The Warehouse, where we had the Oysters Warehouse, baked oysters covered with special *secret* ingredients like bacon and Parmesan cheese!! I don't like oysters normally but I LOVE these!! Then we went to the next restaurant, the Waterfront Grill. There we had a delicious filet covered in a shrimp sauce. That steak was so tender I cut it with my fork!! Yummy! Now by this point, I'm about to die! We are splitting all of this but still!! Our last restaurant was the Brandy House. They have a wonderful pastry chef and the dessert menu is always different. Tonight our choice was the Disgusting Chocolate. It was a flourless chocolate cake (can you call it a cake since there is no flour??) topped with vanilla bean ice cream and a rich chocolate sauce! It was sinful to say the least. I will be doing some research (googling!!) to try to make this. We had a wonderful night! This was very fun to do!! Oh, funny story about the oysters. They're served on the half shell on a bed of rock salt. After a little while, we were trying to figure out how many we had eaten so we'd know how many we each had left to eat. There were a dozen, supposedly, to share. So he counted, then I counted, but obviously somebody else didn't count! There were only 11!! I wonder what kind of dozen that is?? Definitely not a baker's dozen!! I wish I had taken pictures of all this wonderful food!! We did it! Our first media fast (no tv, texting, radio, computer) was successful!! Of course it was helped greatly by the fact the we were getting ready for the baseball party at our house. I never really thought about how many times I walk by the computer to *just check my email*!! Then I would have to click on a link then just read this other website. Next thing I know, it's a 30 minutes later (or longer!!). The goal of this was not to make us miserable (!!) but to get us focused. Focused on what is important - God. I'm sure this is going to make a difference in our life!! On the lighter side, I KNOW Jake stayed up until midnight so he could check his email and this game he plays!! Teenage boys!! The baseball party was a hit!! Brad did an awesome job with the fish, fries, hushpuppies, cheese sticks and chicken nuggets. Our friend Wayne was able to get us fresh catfish from the catfish farm. Man oh man!! That was some GREAT fish!! Laura, please tell Wayne thank you thank you!!! Brad was finally getting to visit after frying all that food but it was time to start the ice cream. I was brave and got it ready. He is famous for this ice cream and I have NEVER EVER done it. But I wanted him to get to the enjoy the party too, so I did it! It was just as good as his! YEA! I have to tell you, I was nervous!! Today is our anniversary!! 21 years!! That is just so hard to believe. When did we get that old?? Where has all the time gone?? Sometimes it feels like forever and others, it feels like yesterday. He is a wonderful man and treats me like a princess! It thrills my heart to know he still finds me attractive after 3 children and many extra pounds!! I love you!! Pictures from yesterday will be coming.......but don't hold your breath!! Where to start??? Baseball season is over for Jonah! They had an awesome season! We're having the end of season party here Thursday night. My sweet hubby is frying fish, chicken, fries and tots for everybody. Then he's going to make his famous homemade Oreo ice cream!! YUMMY!! Jake has 2 more games to go, then he's done. I think he's ready to be done. They started off the season great, then fizzled. Some of the guys have just quit doing their best. Today is Josh's first day doing a full workout program at the junior high. Monday they maxed out. Some of his were great and some not so great. But he's never done weights before. Yesterday, Jake was a man. One of his friends' mom died and he went 5 hours to the funeral. His friend has lost both parents, her grandfather and an uncle in a 2-3 year period. She is just 14. Brad mentioned to Jake that he should ride down with their youth minister for the funeral. I never thought he would, but he did. We talked about how good it would make his friend feel when she saw some of HER friends there showing their support. I am proud of him!! Since Jake was with the youth minister for 15 hours yesterday, I asked him if he got some scoop on the youth group. He found out that every Thursday will be a *focus* day. That means NO ELECTRONICS whatsoever. Goodness!! Whatever will he do?? I told him that I would try (keyword there!!) to do it with him. I'll let you know how we do!! http://sdquarterly.com/ I tried to make it link but couldn't! Sorry!! Have fun!